Disney's Hollywood Studios, DHS, is a mixed bag for my family. My brother-in-law, niece, and nephew aren't crazy about roller coasters, and my sister and I can't get enough of them. The park is fairly centered around shows, in my opinion, and I don't love sitting through show after show after show. It's a "one day" park for me, but I do like to go there on each trip. 1. Thrill Seekers: This park is a MUST for thrill seekers! Tower of Terror and Rockin' Roller Coaster are the best thrill rides at Walt Disney World. The theming in both queues is very detail oriented, and the rides themselves are out of this world. My personal favorite is Tower of Terror. It changes each time you ride it thanks to the computer program running the vertical drops of your elevator. Something about leaving my stomach 3 floors above me just pulls the screaming laughter from me! To some this sounds like a nightmare, but I could ride this one for hours! If you love the sweet sounds of Aerosmith, you have to ride the Rockin' Roller Coaster. Be warned, it does go upside down. If you are traveling with a thrill seeker, but you're happy to sit on the sidelines, the queues really are cool. You can walk along with your braver counterpart, and at the front of the line, the cast member can guide you out of the attraction without you having to fight your way through the queue backwards or having to ride the ride. This option keeps you with your travel partner(s) which makes the wait less lonely for you both. 2. Toy Story Midway Mania: I have visited DHS without riding this attraction, BUT it really is a must do. Simply put, the queue gets insanely long quicker than you can blink. If you want to ride this interactive, family-fun, game of an attraction, you must either get to the park first thing in the morning, or make sure to get a Fast Pass the second you get in the park. We have found that the posted wait time is MUCH longer than the actual wait time. If your party is willing to be split up, cast members often go through the queue looking for singles or couples to move to the front of the line to fill in spots in the ride vehicles. My sister, brother-in-law, and I spoke up one time and split up into 1 and 2 and rode within 5 minutes of each other. While you wait in the queue, spend the wait taking photos with your group. There are plenty of great photo ops! how much my sweet nephew has grown since then! 3. Animation Courtyard: This area is back in the Disney Junior area. It's a large room with interactive computer stations filled with characters to meet! During peak season, it's FULL of characters with short lines to meet them. During off peak season, it's still full of characters (not always as many) and always has a featured character from a recent movie as well as Sorcerer Mickey. The Incredibles used to have a spot there as well, and I believe they still do. You can go straight to the Courtyard without viewing the movie beforehand. If you're not sure of where to go, ask a cast member. They can point the way. and it's something within their character's nature. 4. Star Tours: Recently redone, this attraction is a crowd pleaser! It is a flight simulator that takes you on a journey through the Star Wars universe. The lines moves fairly quickly, and just like Tower of Terror the ride changes each time you ride. I suggest riding it until you see the Naboo ending. It was my favorite by far, and every time I experienced it, the crowd in my car left laughing and clapping (literally) with joy! 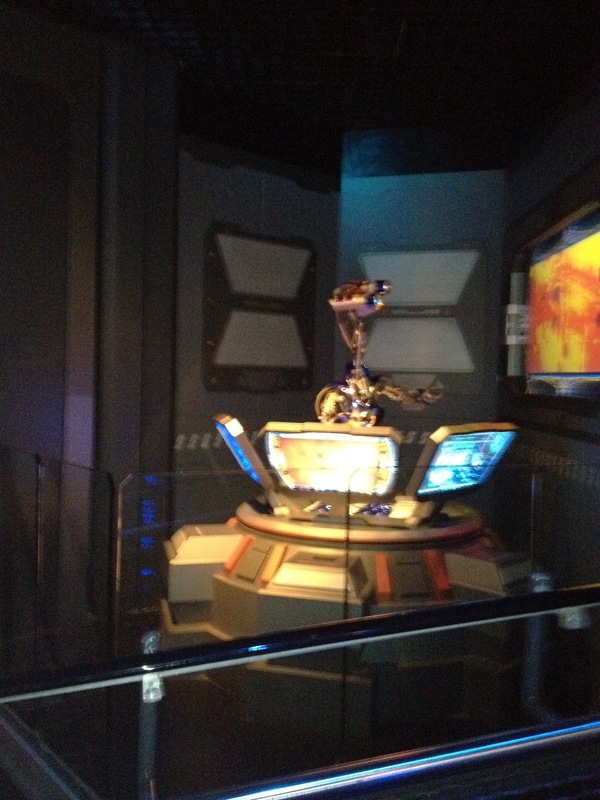 This Star Tours drone is voice by Patrick Warburton. 5. Shows: DHS is themed to be a Hollywood studio. That means that a large portion of the park is set around shows, street actors, and other Hollywood experiences. The evening show, Fantasmic!, is a beautiful show on a body of water that ends with a steamboat full of characters, many of whom you won't see out in the parks. Be aware that in peak seasons, you'll need to get in line for this show fairly early. My family has seen the show once, and that was through a dining package which allowed us to skip the line. While we'd be happy to see it again, the line isn't worth it, and that should tell you something. Other shows feature Indiana Jones, stuntmen and women, Disney Jr characters, the Little Mermaid, and many more. A Times Guide is a must at DHS just to keep up with all of the shows! If you time it right in the summer, you can go from one air-conditioned show to another shaded one right after. Tuesday we'll head to the fourth and final park in Walt Disney World: Disney's Animal Kingdom.